A couple months back, I was doing one of my regular weekend drives, and I caught an episode of Randy's Vinyl Tap on CBC radio. Great show, hosted by Randy Bachman, where he is providing his insights and commentaries on assorted music past and present. The topic of the specific show was Mondegreens. A Mondegreen is lyrics of a song that we mishear. There were a lot of funny ones, listen to podcast. If you want a couple hours of good music and great musical insight you should also just listen to the program. Acedia, A Long Lost Word. A couple weeks back I was listening to Words at Large on CBC Radio it was but the subject of acedia came up. Acedia & Me: A Marriage, Monks, and a Writer's Life By Kathleen Norris was the book under discussion. The author brought up an interesting point, she talked about the Deadly Thoughts instead of Deadly Sins, and acedia fell into the category of deadly thoughts. Was very interesting and the podcast is worth listening to. Think Positive About No Snow! Well there is an upside to no snow. 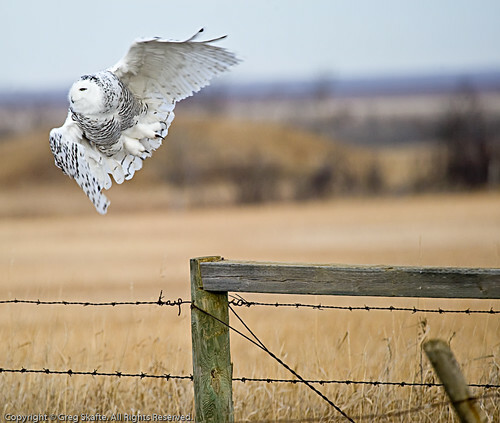 Snow owls are more easily seen. I had been bombing up and down some of my usual haunts. I spotted this guy, and was able to pop a couple of frames off, before he got out of range. I really wish I had some longer glass I would have been able to spend more time with birds like this one. While I'm not unhappy with my 100-400, a 400 f/2.8 would make it so I could use my teleconverters and get little more reach. Ideally a 600 f/4, or even a 800 f/5.6 would be cool. This was cropped out of a shot at 400mm. I was maybe 10m from him and managed to get this frame just as he had enough of me a headed for some peace and quiet. I was able to do a drive by of Astotin Lake in Elk Island National Park. OMG, the water levels, they are non-existent. While I can't exactly walk to a couple of the "islands", mostly because the ground is still fairly saturated, once the frost sets in, definitely. So depressing, you don't have water fowl without water. It won't be too long and we will end up having a big old alkali flat. Reminds me of Pakowki Lake, in Southern Alberta. A large intermittent lake that we tried to visit a number of times in my childhood without success. Random Acts of Violence is the name my friend and I have for, the unprovoked re-education of co-workers and subordinates in the workplace. This continues the theme of the work place being a Sopranos episode started in Life in the business world. The basic premise is: randomly pick someone, belittle them, berate them, or punish them in someway for no reason other than to show you are in charge. Basically you are being the school yard bully. If possible you should share your exercise in dominance with a peer or superior. Also, you make your random act of violence public so everyone else has a calculated fear of you. This is against everything I personally believe in, but seems to be an important survival skill and strategy in larger organizations. My friend has many many stories on this subject but I will leave their telling to him. He has some others but these are my favorites. The Christmas special had a set by Jeff himself, then with Walter, Achmed the Dead Terrorist, Bubba J... and of course Peanut with José Jalapeño. Life In the Business World. The more I take my head of out the sand the more I realize life is really more like living in a Soprano's Episode. A friend of mine and I often have been having these conversations about the criminality and the sense of entitlement that so many CEOs of various public companies have and engage in. AIG and their $400+k beach retreat, after receiving their bailout package. What about the GM executive digging a hole while testifying to congress. I will explore and rant about this further, but my gawd .... where is the honesty and integrity that we were supposed to practice. I realize, that in Canada, we don't have as many undisclosed financial transactions as part of our daily life compared to some places. Bribes are more common here than people think, but we have our blinders on, and think that it's only a practice of the few. Many of my foreign friends laugh at our naivety, undisclosed commissions are an expected part of doing business and life is so many places. I've begun to accept it, and the more I open my eyes, the worse everthing really appears. Well I'm still waiting, with no real precip insight. We had a whisp in the morning, but again all gone... We are running approximately 10°C above seasonal and no end in sight..... it's hard to find animal tracks in the hard pack, more importantly, most of the sloughs I frequent are dry. Some have even been tilled by the land owner. 'Well, where are the low fat and low cholesterol foods, and the decaffeinated tea?,' he asked. We had a wisp of snow, and a couple of drops of freezing rain, but nope .... no real snow :'( and it's still unseasonably warm. When I was walking home from work today, I saw the first flakes of snow.... FINALLY. In my travels around the country side far too many of my favorite sloughs are dry. We need several inches of rain, or several feet of snow. Something. Anything. How can you take pics of puddle ducks, if there are no puddles! !